2001; 205 pages. 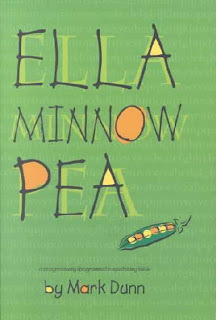 Full Title : Ella minnow Pea - A Progressively Lipogrammatic Epistolary Fable. Genre : Contemporary Literature. Overall Rating : A.
Amanda wrote an excellent review of this book last month here. She covers the plot and key themes nicely. Here's the storyline really abbreviated : The idyllic life on an isolated island off the coast of South Carolina becomes dystopian when the tiles bearing the letters of a sacred phrase ("The quick brown fox jumps over the lazy dog") begin to become unglued, thus falling off and shattering. If you'd like to know more, read Amanda's piece. The main delight of Ella Minnow Pea ("LMNOP") is the wonderful wordplay created by Dunn. It's sort of a literary mix of the poetry of Sylvia Plath and Ogden Nash. Have your dictionary handy when you read this book; Dunn introduces you to a lot of beautful-but-obscure words, and a bunch of mellifluous ones he simply made up. The main message of LMNOP is this - don't blindly accept the edicts of the politicians and organized religion. Try the spirits, examine the prophecies, and evaluate the probability that a Deity has for some reason chosen them to convey a message to you. To quote a great slogan from an otherwise silly sect : "To question is the answer". Another less-obvious hypothesis fleshed out in LMNOP is that a language is an organic, evolving entity. The natives of Nollop speak English, but due to their isolation, it's a bit different from our "American", and/or the King's "English". Similarly, I own a "How To Communicate In Autralian" phrasebook that exists because of that sort of isolation. Alas, as more and more of the letters of the alphabet become taboo due to Nollopian laws, their language suffers as well. By the end, when only five letters remain legal, speaking and writing are reduced to essentially a five-year-old's level. If you're in the mood for a dystopian novel, don't read this book. Ditto, if you're looking for a complex storyline and deep character development. The dystopian setting and the letters written are merely vehicles for Dunn to develop the themes listed above. The fact that the oppressive bad guys give up their power after reading a single sentence is ample proof that this isn't a serious look at a Brave New World. I enjoyed this book immensely, especialy since it agrees with my views on the themes Dunn addresses. The purpose of language is to communicate. Commas and semicolons should not be bound by silly rules; they're an art-form. And if you have an opportunity to make up a new word to convery your ideas more clearly (or use an existing word in a new connotation), well kewl beans! You're helping the generational evolution of English. I read LMNOP because of Amanda's review; who read it because of Rebecca Reid's review; who read it because of her mom's review. There is purpose in what we're doing at this blog, so keep on five-squaring and practice linguo-elasticity wherever possible. I'm glad you found the book. I really liked this one. Totally agree with you - the themes were much to my liking, too. Let's hear it for the Public Library, which is the only place i found it. LMNOP apparently is Dunn's first novel, altho he had previously written a bunch of plays. the used bookstore had his second novel. i forget its title, but it was set in the South and looked like A Conferacy of Dunces wannabee. so i passed on it. Hm, maybe I'll look it up in a couple years once I've gotten my TBR list a little bit more under control. it didn't look near as intriguing as LMNOP. i have a feeling he's gonna be hard-pressed to repeat his initial success. Yeah, I checked out a couple of his on goodreads, in the descriptions, and none of them sounded real great. I didn't add them to the tbr pile. I suppose I'll wait to see if one of my friends picks one up and likes it, first. I'm glad you liked it too! I think it's a book most any one will like -- whether they are looking for deep thoughts or light-hearted story.